We had THE BEST New Year's Day ever! I had to get up at 3:20am, that was the worst part. 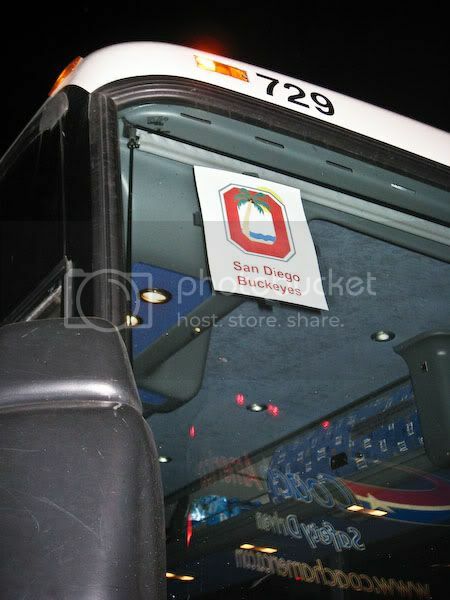 Around 4am, we left our house and drove up to La Costa to catch the San Diego Ohio State Alumni Club's bus up to the Tournament of Roses Parade. The organizer, Gary, told everyone to remember our bus name and number, because there will be hundreds of buses at the Rose Bowl parking lot. 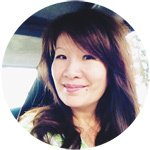 The phrase "Remember where we parked" becomes paramount, LOL! 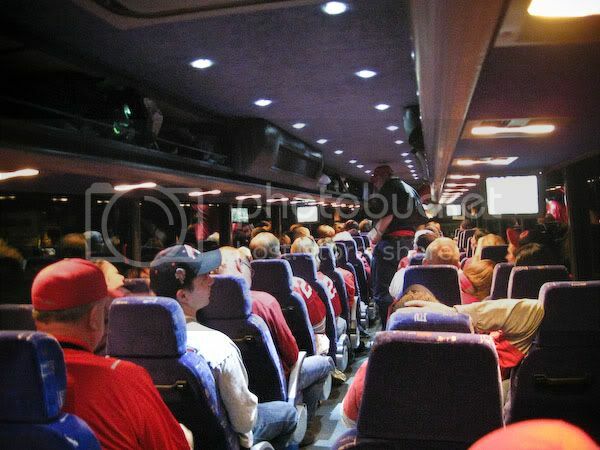 All the excited but bleary-eyed Buckeyes on the bus, in the dark, headed towards Pasadena. They showed a DVD of our 2002 Fiesta Bowl National Championship win, which got all of us excited. I was able to sneak in a half hour nap though. 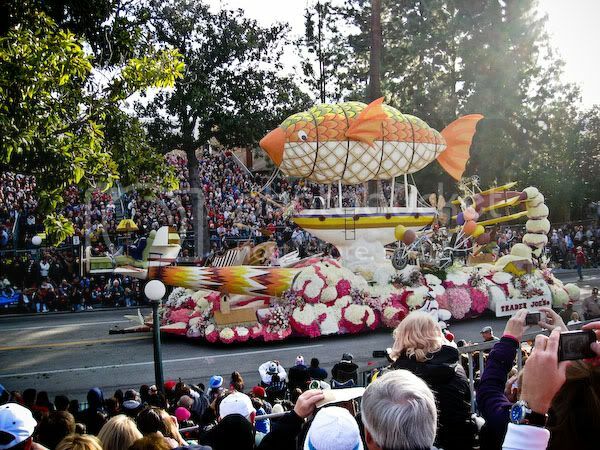 Before we knew it, two hours had passed and we arrived in Pasadena. 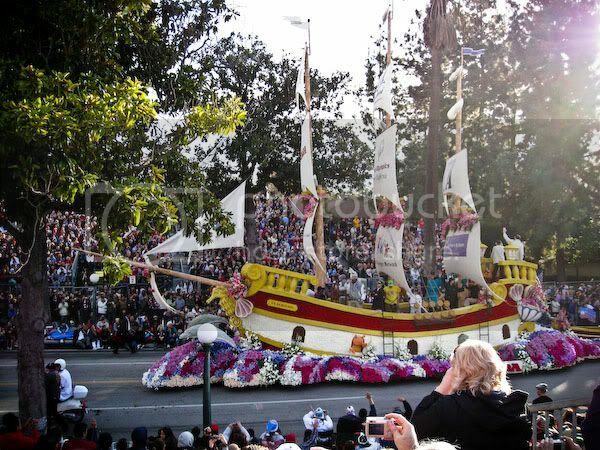 Todd's mom's sister Diane and her husband Les had our Rose Parade Grand Stand tickets. They came from Oregon for the festivities. (They're Ducks!) 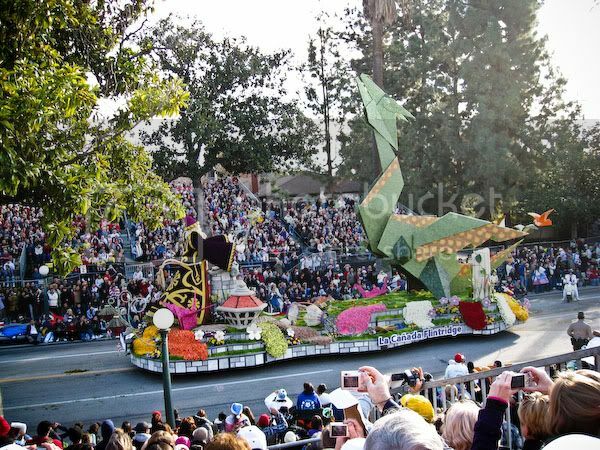 We had some difficulties using the cell phone (bad coverage with so many people) to get in contact with them and finding them so we could get our parade tickets. We finally snaked our way to the Grand Stand and Les was waiting for us at the entrance with our tickets, wearing all his Oregon Ducks regalia! Turned out we were at a Duck section of the Grand Stand, since they got our tickets. The Duck club provided breakfast boxes as part of the ticket, which was really nice. 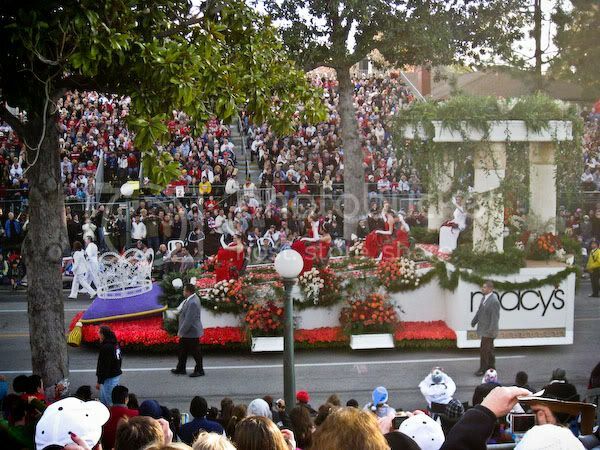 We got into our seats just as the parade started at 8am. I had a hard time taking good photos because the rising sun was right in my eyes. 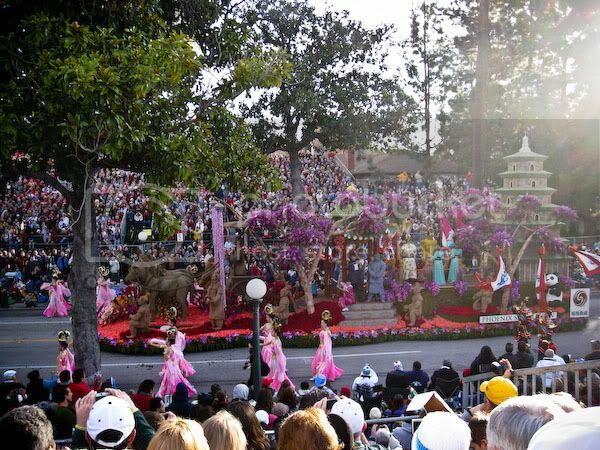 The Tournament of Roses Royal Court. 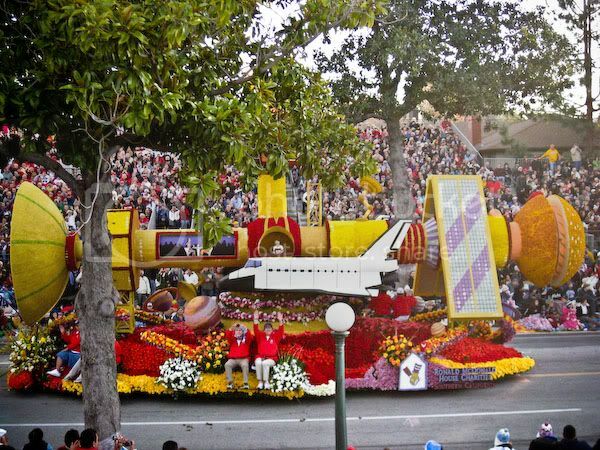 Ronald McDonald House Charities Float. 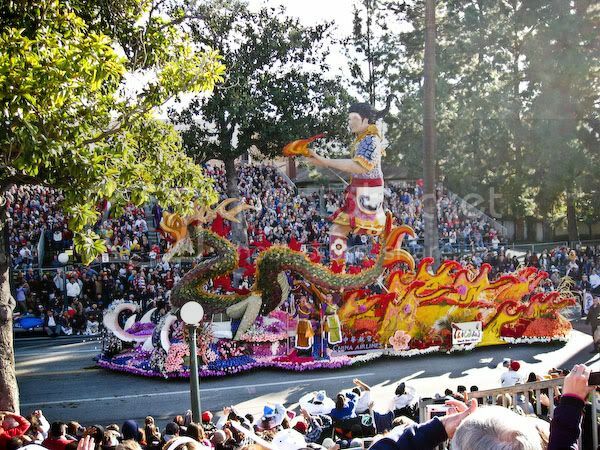 A Chinese-themed float with terracota warriors. 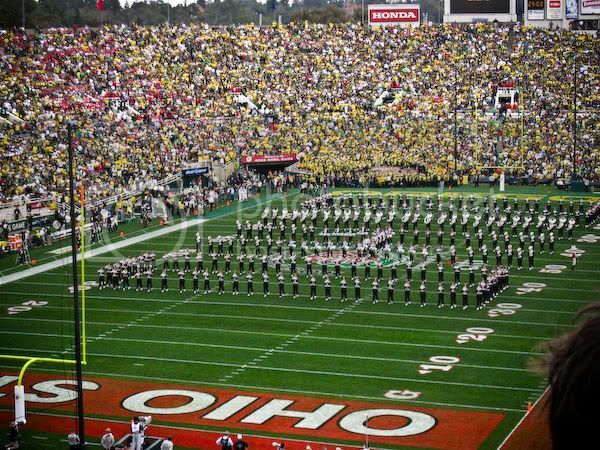 THE Ohio State University Marching Band! There were a ton of horses in the parade too, and you know what that means. 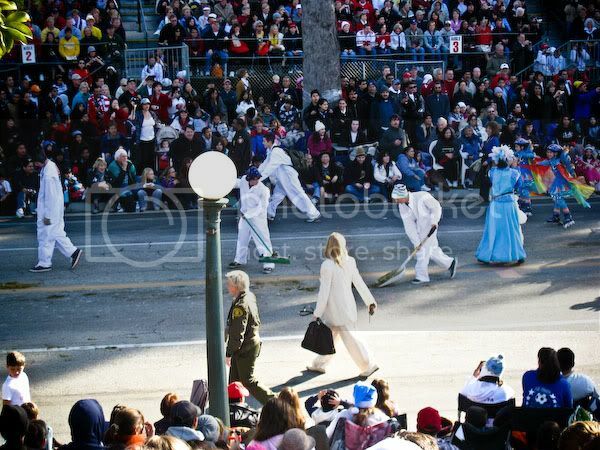 I thought it was hilarious when the "Pooper Scoopers" walked in the parade too, and did their work at the same time. I loved being there, but I wish we had brought a radio or something. 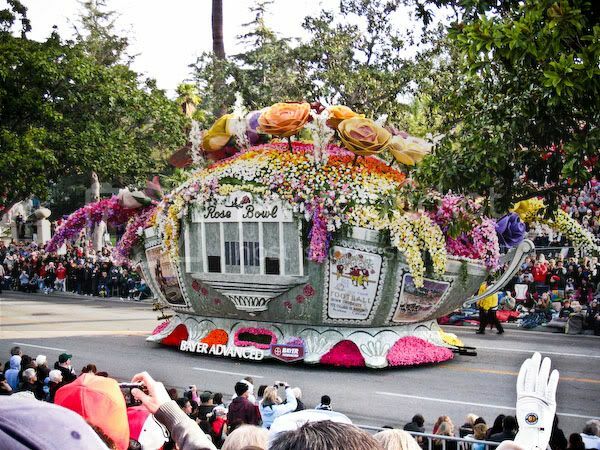 I missed the float commentaries about what flowers made up each float, etc. 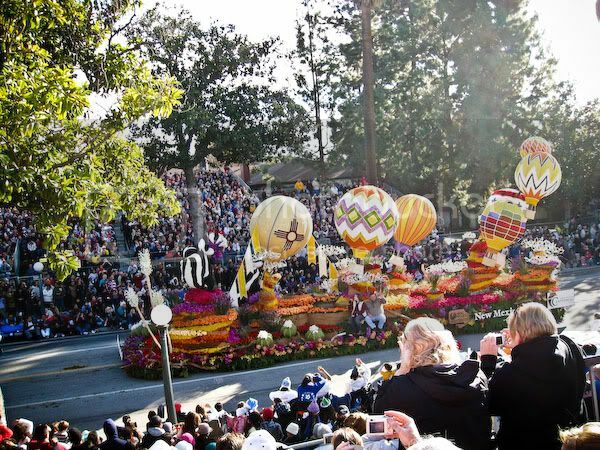 The parade was about two hours long and ended right after 10am. We went back to the Buckeye Bus to ride to the Rose Bowl stadium, while Todd's parents chose to walk with Aunt Diane and Uncle Les. Guess how long it took the bus to drive the 1.5 miles to the stadium and park in the bus lot? Over an hour and 15 minutes. However, the walking part of our party didn't fare so well either. They wanted to go to the grocery store to buy something to take to the Duck tailgate party, and ended up walking two miles each way. When they finally got to the tailgate, it was over and everyone had gone inside the stadium. We decided to just meet at our seats inside the stadium. Todd and I grabbed some $10 sausages and $8 garlic fries (boy do they gauge you there, LOL) for lunch. We were hungry! 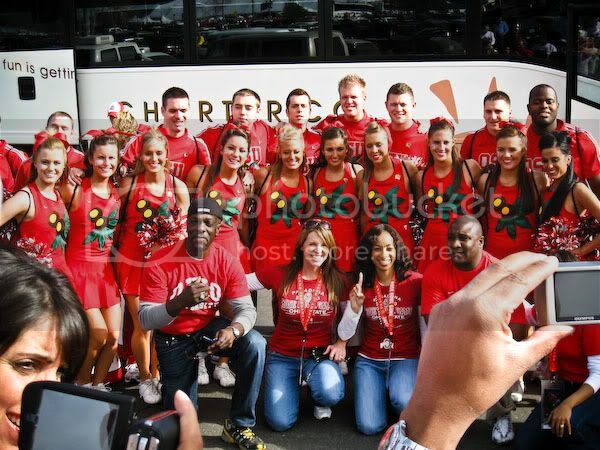 As we walked towards the stadium, we saw the Buckeye Marching Band get out of their buses, as well as the cheerleaders. It was a zoo trying to get inside the stadium. There was people everywhere! 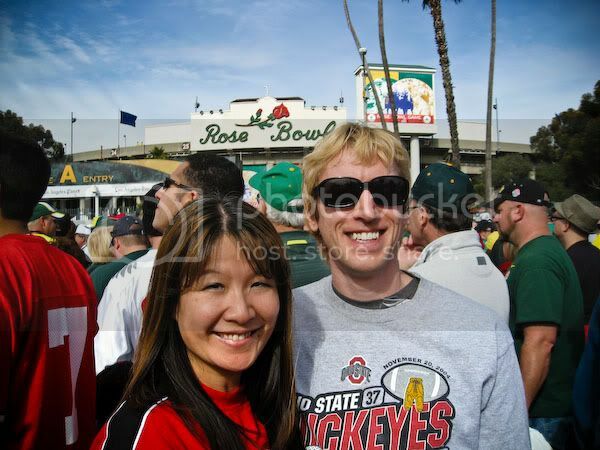 We asked someone to take our photo in front of the famed Rose Bowl. 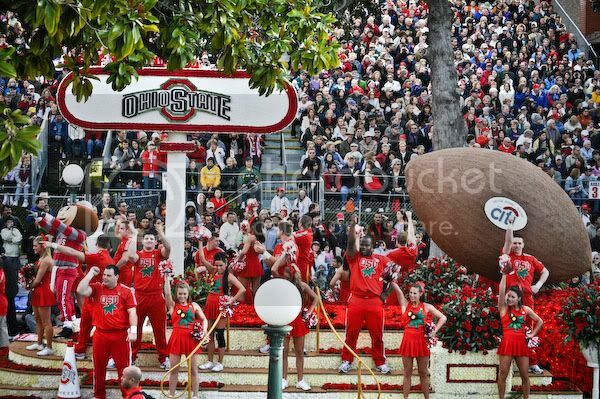 The Buckeye team getting psyched up for the game. View of the stadium from our seats. We heard someone call our names, and lo and behold, our friends the Morrises were seated just a section over! So we went over and chatted with them. I worked with both Chris and Tim in Dayton, Ohio. 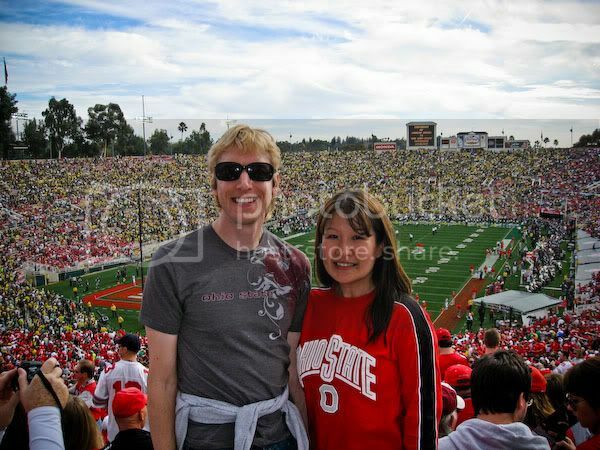 We seem to go to or meet at Buckeye games a lot! 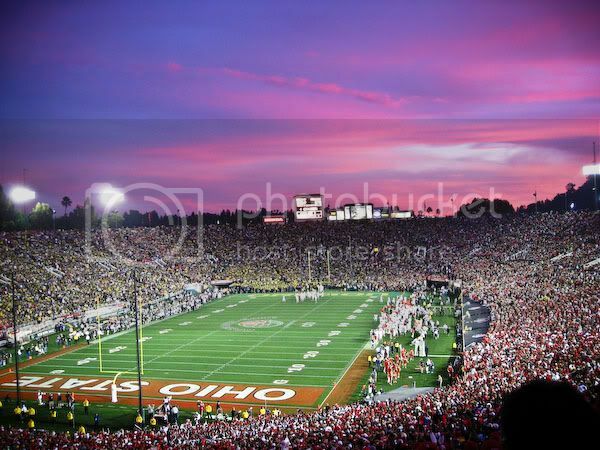 In the late 1990's we went to Chicago to go to the Buckeyes vs. Northwestern game with them. 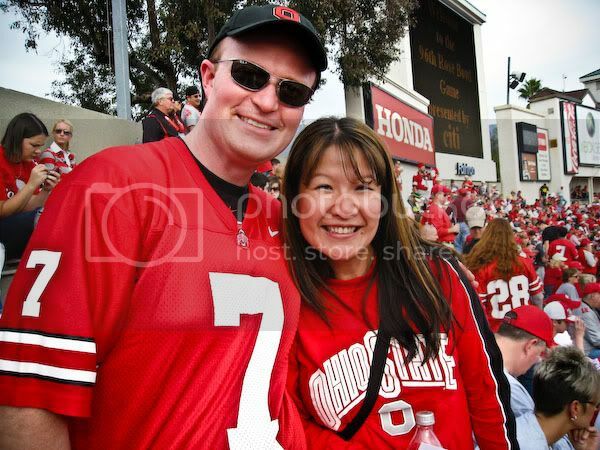 Then we met up with Tim and Michelle after the 2002 Fiesta Bowl National Championship game in Tempe, AZ. 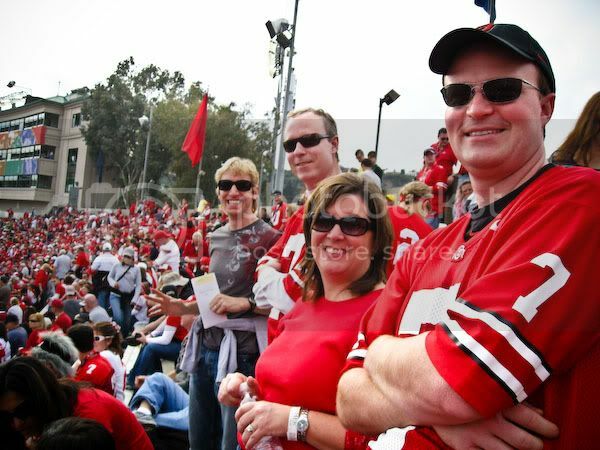 Then in 2008 we met up with Chris and Tim at the Buckeyes vs. USC game at LA Memorial Coliseum. It was GREAT to see them again this year! We asked the people sitting behind us to take our photo inside the stadium. Finally Todd's parents and Diane and Les arrived to the seats. Aunt Diane made the "O"regon face in every photo, I think. 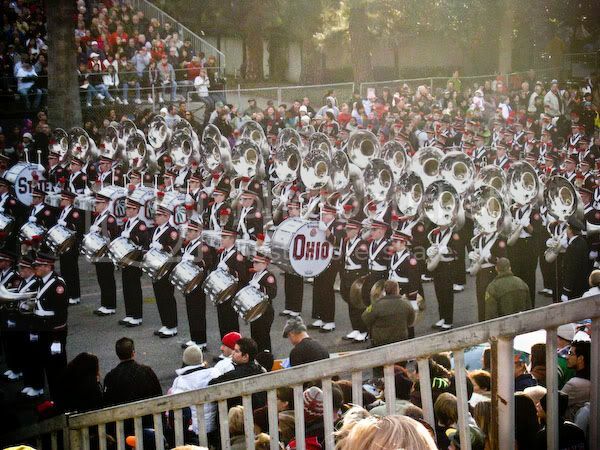 The Buckeye Marching Band coming out. 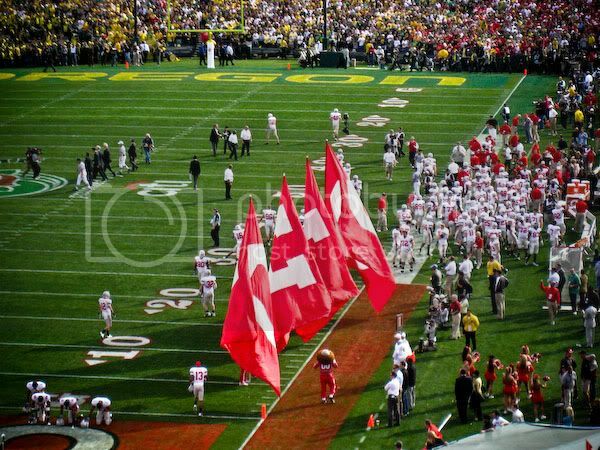 The team taking the field. The sunset at the stadium was unbelievable! 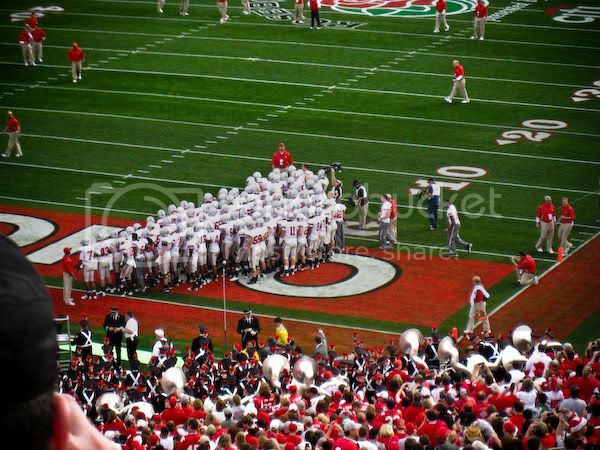 It was truly an awesome game from the Buckeye point of view! We were underdogs and nobody gave us a chance. 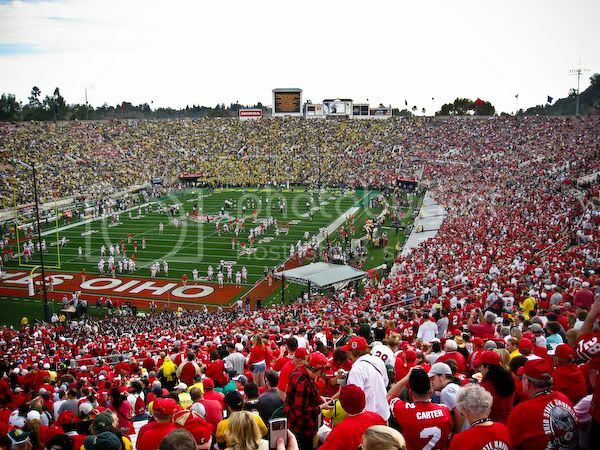 But we beat the Ducks pretty soundly 26-17. Our time of possession was over 41 minutes! 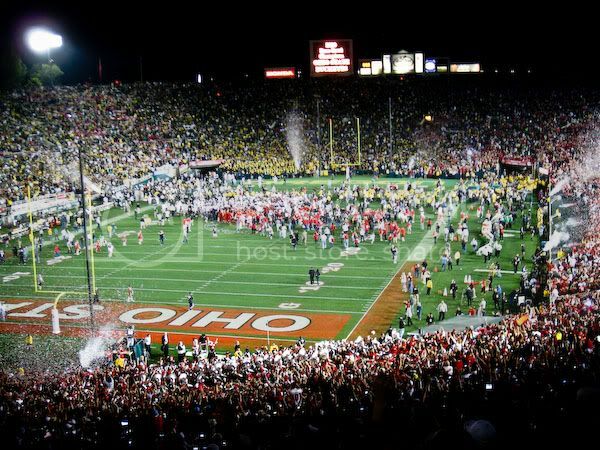 When time expired, the Buckeyes rushed the field. 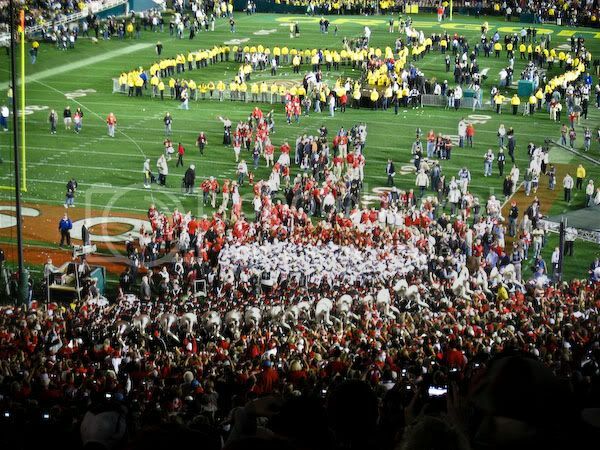 The team came over to the band after the trophy ceremony to sing "Carmen Ohio". 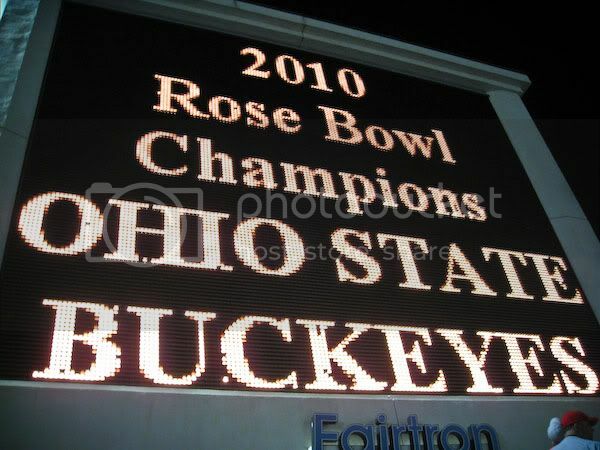 The scoreboard said it best. We were so excited and happy after the game as we walked back and found our bus. We got back home around 8:30pm. It was a REALLY long day, but WAY worth it! Even though we were tired, we had to watch some of the game highlights on the DVR before going to bed. :) It was the best New Year's ever. I knew you would be there! Love every picture...the parade, the game, the sunset..simply gorgeous!! Congrats on the win...it's been a great college football season! fantastic pictures and a great event!!! Gilbert and I wondered if you all went to the game. So glad you did. What an incredible time everyone had, crowds and all. Oh, my gosh, that looks like so much fun! 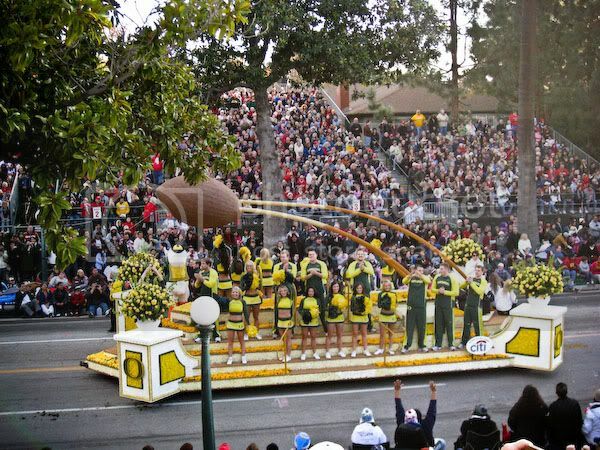 I wanna see that parade some day. What a fun day...made even better by a win! 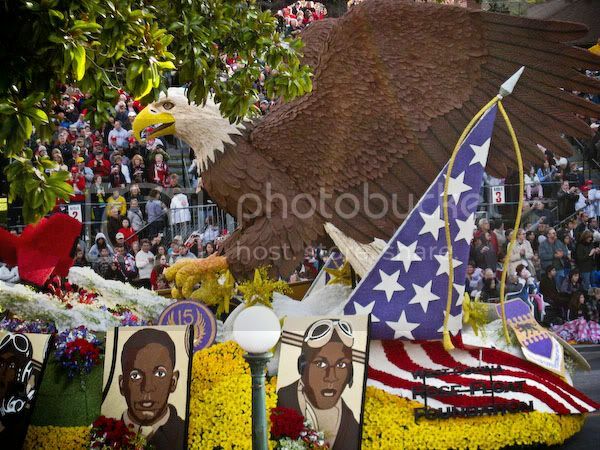 Loved the pictures, both of the parade and the game. Such vibrant colors! I wondered if you were going to the game. What an exciting day. 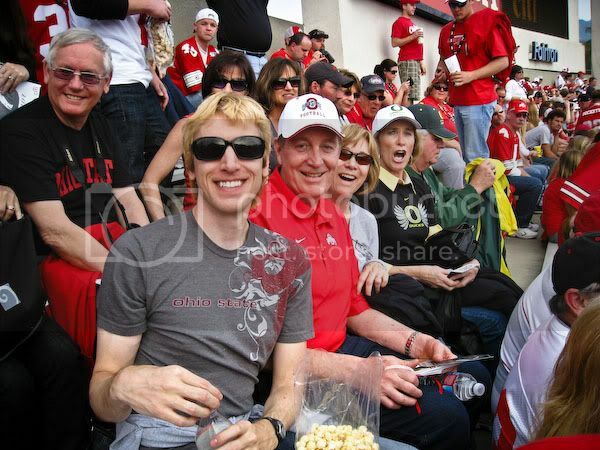 I really like the photo of you and Todd in the stadium. What a great way to spend the new year.